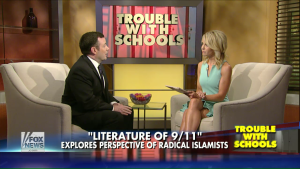 On Fox & Friends Monday, Elisabeth and Joe discussed the University of North Carolina, Chapel Hill’s class that views the 9/11 attacks from the terrorist perspective, blaming America and ignoring the victims. Please click here, on the link below or on the photo above for the complete discussion. I witnessed the WTC attacks from my nearby office having just commuted through the PATH station as my cousin, father’s god son Steve Schlag was murdered with the 3,000 others. These people in Gitmo are terrorists and I resent a Leftist professor indoctrinating our kids that somehow America is to blame. The professor derides America as an imperial nation: America liberated Europe from the original Nazis and all we took was land enough to bury our dead. We paid our respects at the somber yet awe inspiring American Cemetery in Luxembourg in 2012. The authenticity of the ‘poems” in Poems from Guantanamo: Detainees Speak is in question. Many believe they were not written at Gitmo at all but in Kuwait and used for propaganda against us. Even so, this Leftist Lawyer, Falkoff is taking a page out of the book of lawyers for 1970s terrorists who tried to mainstream Black Panthers like Eldridge Cleaver and George Jackson, (Soul on Ice and Soledad Brother respectively.) Leftist terror lawyer Lynn Stewart highlights art work by FALN terror leader Oscar Lopez Rivera who remains in prison having refused the Clintons’ 1999 clemency grant. If you recall the FALN murdered my father (cousin Steve Schlag’s god father) at the Fraunces Tavern terror attack. This entry was posted on August 31, 2015 at 11:24 am and is filed under 9/11, 9/11 Memorial, Education, Fox & Friends, Fox News, Freedom Tower, Government, ISIS, Islamic Terrorists, Justice, Marxist, National Security, terror, terrorism, terrorist, The New Founders, University of North Carolina, We Win America. You can follow any responses to this entry through the RSS 2.0 feed.